WatchGuard's Access Point range allows you to deliver a comprehensive, flexible internal and guest wireless without compromising security. Delivering some of the most advanced WiFi services available on the market including Wireless IPS, RF optimisation and guest analytics with multiple units managed through your WatchGuard firewall and / or the cloud. The solution allows network administrators to save money by avoiding a separate wireless controller without sacrificing any of the functionality delivered by high end wireless solutions. WiFi services for office and public locations. Highly capable appliance for demanding small networks. Reliable, and affordable access point. WiFi for small and remote offices. Delivers broad, fast, and reliable Wi-Fi. Brings WiFi to outside environments such as stadiums. Cost-effective fast and secure Wi-Fi access. 802.11 Wave 2 technology that meets your budget needs. Super fast wireless for demanding deployments. Connects a crowded room full of devices simultaneously. WatchGuard WIPS is an enterprise-grade solution that defends your wireless zone from unauthorised devices, man-in-the-middle attacks, rogue APs and much more. This can be extended by adding the security of running your device behind a Firebox device scanning all traffic. Management of WatchGuard's WiFi solution can be through your gateway Firebox device or in the cloud. Cloud deployment allows estates to scale from one to an unlimited number of devices across multiple locations. 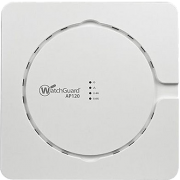 Not only do WatchGuard WiFi solutions incorporate the latest 802.11ac standards delivering up to 1.3Gbps they also come with RP Optimisation, spectrum monitoring and built in trouble-shooting delivering bulletproof security and reliability. Three deployment options are available for WatchGuard APs. Wireless can be extended to your LAN by deployment behind a Firebox delivering control and security, Cloud based management delivers flexible deployment, WIPS and analytics. Or devices can be deployed combining both, delivering ultimate WiFi services and security. Manage your wireless solution via your mobile device using the Go Mobile Web App. Standard features enable simple deployment of spash pages and custom portals. WatchGuard's WiFi Cloud service is built upon RESTful APIs to handle massive distributed wireless deployments. Deployment of guest WiFi can increase revenue and customer loyalty by the use of custom portals for access, videos, polls and surveys and then monitor their responses. Allow users to authenticate with social media gaining an insight into the nature of your visitors and their behavior. Gain insight into your customers with comprehensive analytic tools delivering information on gender, age, buying behavior, customer location, footfall and much more. Reports allow administrators to view gathered user data across time and location groups. Comparative features and statistics of the WatchGuard Access Points. Click the to remove a unit and select from the list on the right to add another.